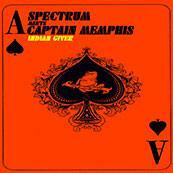 Spectrum Meets Captain Memphis - "Indian Giver"
An interesting album and novel collaboration, it's hard to give this album a full thumbs-up due to its lack of cohesiveness. But really the whole "album experience" can be overlooked as there are some truly wonderful tunes on this release that you'll probably end up programming into your own life's digital soundtrack anyhow. I'm not well-versed in the history but I researched enough to state that Jim Dickerson, aka Capt. Memphis, has produced some pretty big names. And you probably already know that Spectrum is Pete "Sonic Boom" Kember. The liner notes are cool the way they build up a sort of myth around this meeting of minds, with Kember parachuting into the swamps of Mississippi for the session. The album is bookended by a sublime Neu!-styled romp called "Mary", the intro being brief and quickly segueing into "The Lonesome Death Of Johnny Ace", basically a rather hackneyed country-blues over a buzzing programmed rhythm, though bolstered by Kember's whimsical theremin and cold-wind synth noises and the Captain's distinctively gritty voice... drags on too long, though. Symmetrically interspersed are non-collaborative tunes, the first being a remake of an earlier Spectrum song, "Take Your Time", but this version sounds superfluous. The best of the collaborative tunes is "Til Your Mainline Comes", a slow moody blues, the Captain at his peak here, rattling off some great beat poetry over piano, stand-up bass, a mess of crickets and low haunting fx. Then comes "When Tomorrow Hits", Mudhoney being a group that Memphis has produced, but not knowing it was theirs' I'd just assumed it to be a Spacemen 3/SB/Spectrum tune with its plodding fuzz riffs. "The Old Cow Died", with its tronics and theremin vs. the Captain's great spoken-word delivery and the blues guitar can be an odd combination, but they pull it off, making it a really special sound... "the cosmic beer joint" indeed. One of the questionable remakes, "Hey Man (Amen)" follows, but it's my favorite SM3 tune, so I don't mind. The excellent "Confederate Dead" begins with the sound of distant muskets afire before trudging on a sad death-march, augmented by fiddle and the gorgeous outro-keyboards of frequent Spectrum member, Fuxa's Randall Nieman, and segueing finally into the thankfully full-blown "Mary" reprise and its slow fade out.